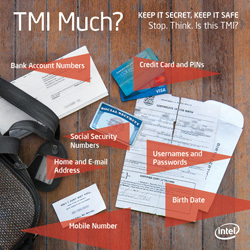 Intel Corporation has joined with McAfee, Dell and other tech companies this summer to help fight the problem of people oversharing information online. The campaign aims to educate social media users via a series of infographics about what information they should and shouldn’t provide online. They also have some tips on how to avoid falling prey to fake apps and Facebook scams. According to the campaign, the amount of personal information that web users disclose is shocking: 52 percent of social network users have disclosed information that could be used to commit a cybercrime against them, while people have an average of $35,000-worth of assets stored on their digital devices. Meanwhile, McAfee found 2.6 million new suspicious URLs between January and March of this year alone. Malware scams and fake links are becoming commonplace on Facebook, asking users to disclose personal information in exchange for access to a salacious video or the chance to win a lavish prize. They’re easy enough to avoid, however: don’t click on anything that looks fishy, and be careful what information you disclose.